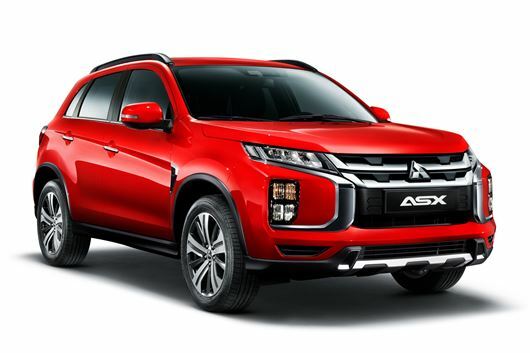 Mitsubishi has released pictures of the updated ASX crossover ahead of its official reveal at the Geneva Motor Show next month. The Nissan Qashqai rival has remained largely unchanged since its launch in 2010. While this isn't an all-new model, it is a heavily reworked version of the current car - bringing with it updated looks and a new 2.0-litre petrol engine. The old diesel engine has been axed - the only engine available is the petrol, although Mitsubishi is yet to confirm a power output or any performance figures. Buyers can choose from a five-speed manual gearbox or a CVT automatic transmission. Two- or four-wheel-drive versions are available. Cosmetic upgrades include a new front end, similar to that used on the Mitsubishi Eclipse Cross, while LED tail lights freshen up the rear. Mitsubishi's also introducing three new colours on the updated ASX - Red Diamond, Sunshine Orange and Oak Brown. Inside, the multimedia display in the centre of the dash has increased in size from seven to eight inches. Top models feature TomTom navigation, while connecting it to the internet via a smartphone app will provide real-time traffic information. Prices are yet to be confirmed for the updated Mitsubishi ASX, but expect it to start in the region of £20,000. That front end - ugly: VERRY ugly!